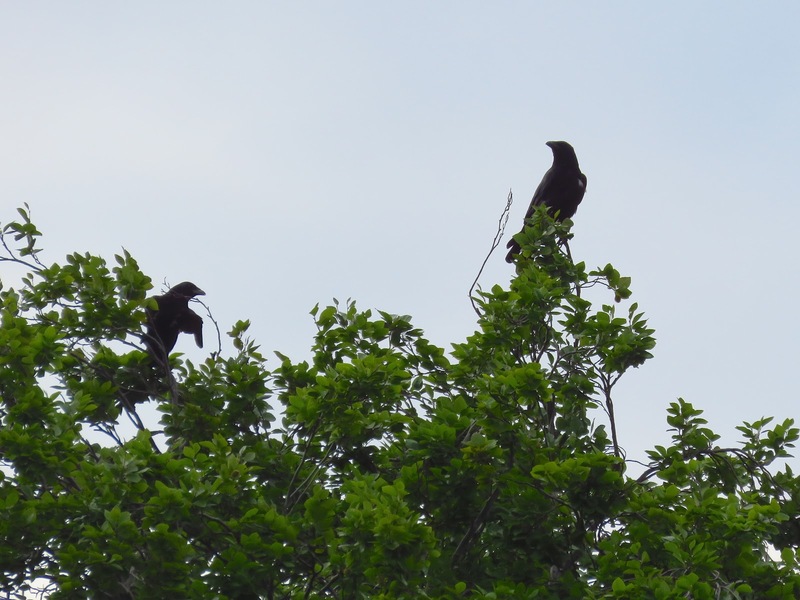 Corvid researchers have ample anecdotal evidence that crows recognise individual humans: crows are unusually alert and often direct mobbing calls to researchers that have previously ringed them, while ignoring other researchers. Other crows follow and harass individuals who feed them in order to obtain food, something that Ralph Hancock has described to me in comments to this blog (see previous post), and amply illustrated in his blog (Charley and Melissa are the pair of crows that often pester him for food). Unlike predators, who tend to be dangerous in general, people can be either very dangerous, mildly dangerous, neutral or good to crows. Some people, e.g. 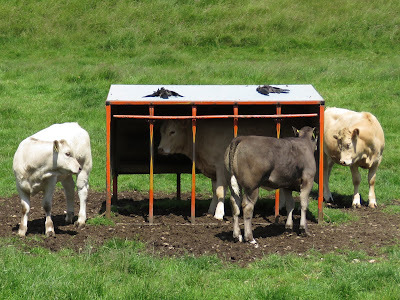 farmers who treat them as pests persecute and kill crows (see photo below) and crows might learn to be cautious when they see them and fly away before being shot. Other people are plain annoying, as bird ringers who trap them, and it may pay to learn who they are so that the trap is avoided next time. Yet others people are good to crows, such as people who feed them, and it may pay to be confiding and even harass them to get more food. It is not surprising that intelligent birds like crows pay attention and learn to discriminate between 'good' 'neutral' and 'bad' people and act accordingly. Two Carrion Crow carcasses on the cows feeder of a local farm. 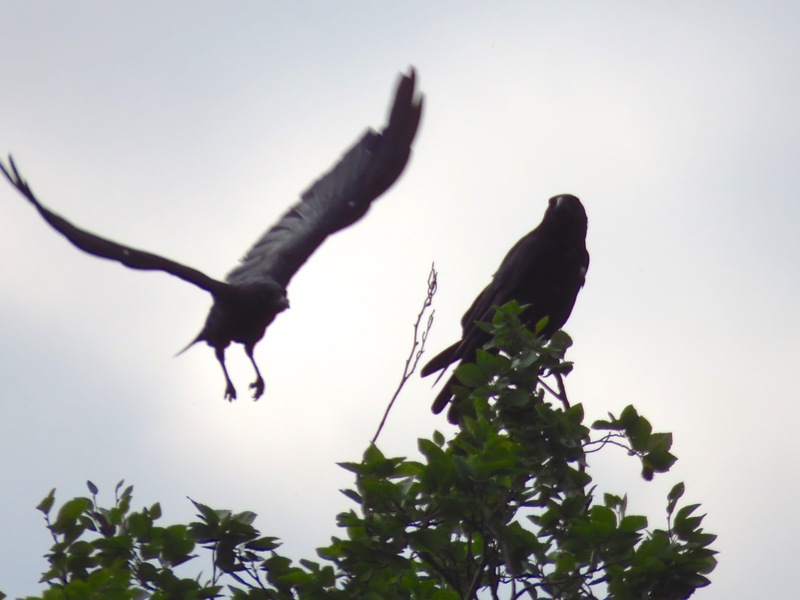 John Marzluff, a researcher at the University of Washington has studied crows for many years, and part of his research has involved trapping and ringing crows in Seattle. Marzluff was aware of the crow's mobbing behaviour towards the specific researchers that had trapped and ringed them but he wanted formal proof. He incorporated ringing into an experiment to test if crows recognise individual humans. 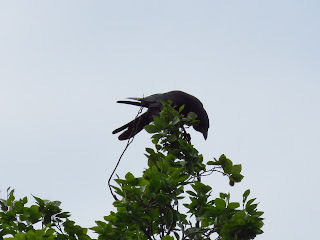 He worked with American crows, Corvus brachyrhynchos, a close relative of the Carrion Crow with a similar social organisation. The research included urban populations that included previously trapped and ringed individuals, and also 'naive' populations that had not been ringed before. Experiments included a single negative event: the setting a trap (a net launcher) to capture feeding crows in 5 different sites. The people activating the trap, capturing and ringing the birds wore specific masks and/or hats (a 'dangerous' mask). Masks were used so that they were interchangeable and effects due to inadvertent researcher behaviour, outfit or body size could be removed. During transects around the crow territories, researchers (wearing either the dangerous mask or a 'neutral' mask) assessed crow activity towards them before and after the trapping event. They in particular noted if crows displayed the 'scolding' response to them (defined as a harsh, alarm ‘kaw’ directed repeatedly at the observer, and accompanied by agitated wing and tail flicking) or were indifferent. The experiments were repeated by people unaware of the experimental design or objectives, which were asked to walk around the crows territories wearing or not the mask used during the trapping event or a different, neutral masks. This experiment removed any subjective bias by the experimenters themselves. The experiments show that crows rapidly learn to recognise the 'dangerous mask' used during the trapping in their local site, with more scolding in response to the dangerous mask than to neutral mask during and after the trapping event, but no differences before the trapping event. In addition, the percentage of local crows scolding the person wearing the dangerous mask increases from 26% steadily with time over 2.7 years to 66%, suggesting that the local crows learn from each other about the dangerous person. The masks used in one of the experiments were of ordinary people and the crows learned to mob the specific mask associated to the trapping and not similar masks. 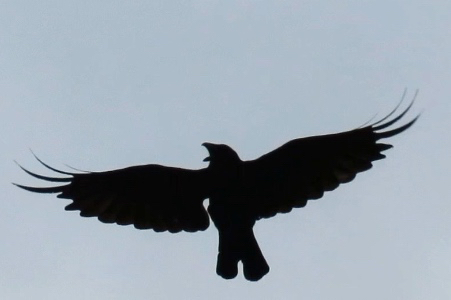 The crows today calling and wing-flicking. Today I walked around the park today with my camera. Three crows at the end of the park, in the same area where they mobbed and followed me three weeks ago immediately flew to the top of a tree and cawed harshly looking in my direction, wing-flicking, then one of them flew towards the tree by which I was standing. I took a video that shows how it is scolding me and records the call. The top shot is a screen gan of the video. As I left the park they stopped cawing. I seem to have become the not so good people to the local crows, maybe I will wear a mask next time. Marzluff, J. M., Walls, J., Cornell, H. N., Withey, J. C. and Craig, D. P. Lasting Recognition of Threatening People by Wild American Crows. 699–707 (2009). Very interesting. You'd need to add neutral people to the experiment as the researchers did, because crows can recognise people from a distance too great to see their faces, presumably by the way they walk. I find that they recognise me even if I'm wearing different clothes. This means, though, that if you put on a mask it probably won't work.